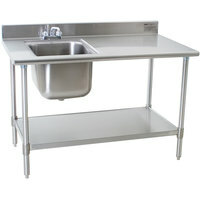 Increase your counter space with this Advance Tabco KMS-11B-305 30" x 60" commercial work table with backsplash, undershelf, and sink. 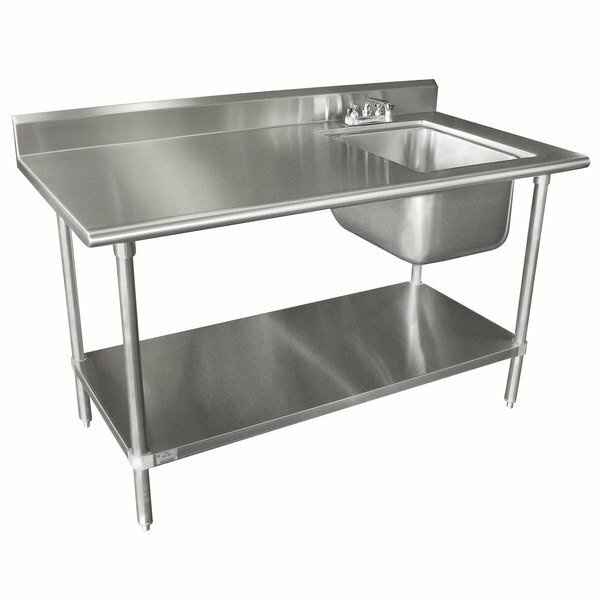 Utilize the space in your kitchen with this dependable 30" x 60" 16 gauge, type 304 stainless steel commercial work table from Advance Tabco! This unit is perfect for completing all kinds of daily tasks, from chopping up vegetables to kneading dough, pressing hamburger patties, boxing up baked goods, and much more. Thanks to the 12" deep sink, you'll be able to wash, rinse, or sanitize whatever you need. 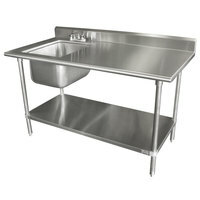 It also features an 18 gauge stainless steel undershelf to provide additional space for storage. "Nice sink. Well built. We had a splash guard placed around sink and it works perfectly for a versatile hand washing station and utility table at our ice cream shop." 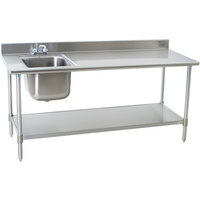 This work table's top shelf is made of 16 gauge type 304 stainless steel for long-lasting, dependable service life. It features an easy-to-clean rolled front, and the sides of the table are squared off for flush placement against walls or other tables. It also features a sound-deadened top to help keep loud noises from disturbing your customers. A 5" backsplash prevents items from falling behind the table, while also protecting your walls from splashes for more sanitary conditions. Plus, the top shelf boasts a weight capacity of approximately 450 lb. Both you and the health inspector will appreciate the convenience of this 12" deep welded sink because of how easy it will be to keep conditions sanitary, no matter what task you're completing! Additionally, the sink comes furnished with a K-50 deck mounted faucet for quick installation, so you can begin using it as soon as possible. 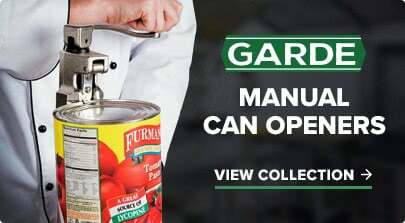 The 18-gauge type 430 stainless steel undershelf adds versatility, allowing you to store additional supplies like cutting boards, bowls, and pans for convenient access. Plus, it is made with a larger welded surface area than the standard table to not only provide additional strength between the leg clamps and the shelf, but also to maximize usable surface area. 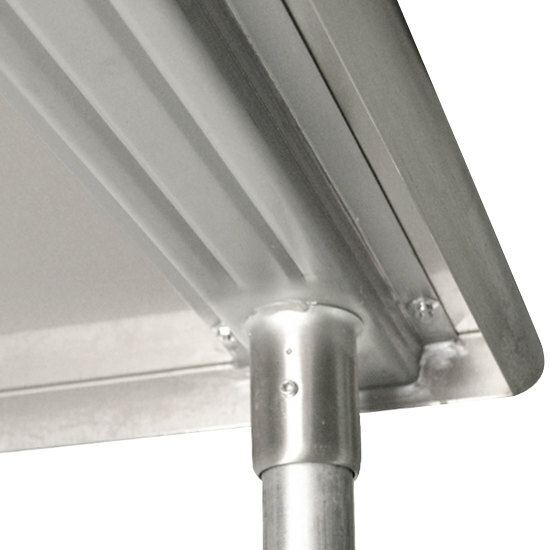 Mounted on 4 strong, 1 5/8" stainless steel legs, this unit will be sure to remain upright and secure. For superior balance and stability, the legs feature 3" gussets. To support the weight on top and maintain a level work surface, this work table is engineered with three reinforcing hat channels. Will using casters on my Advance Tabco work table or equipment stand increase the working height? 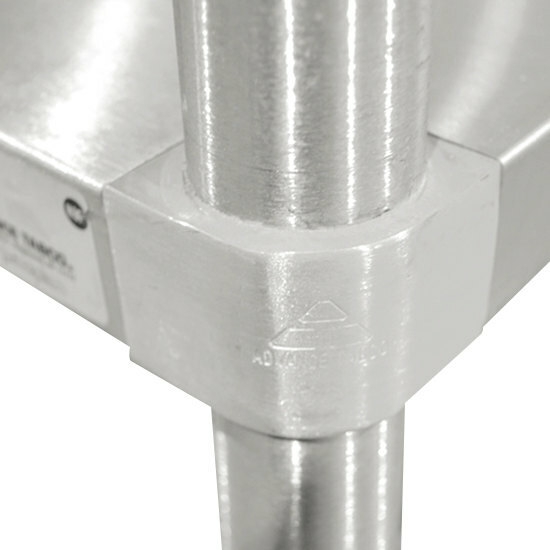 If you order a set of Advance Tabco brand casters to go with your Advance Tabco work table or equipment stand, Advance Tabco will automatically send shorter table legs as an added service. 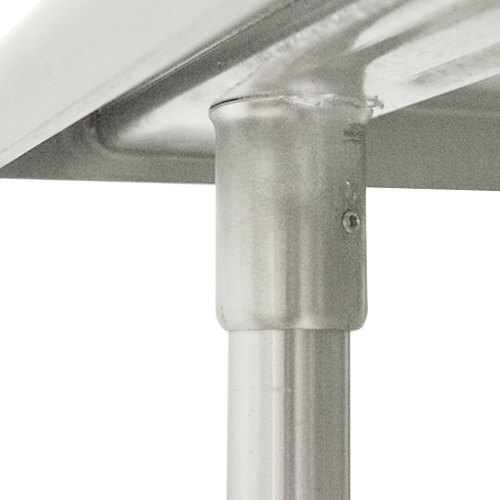 The shorter legs will guarantee that your table’s height will remain the same as is listed on the table’s product page, ensuring a comfortable working height for your needs. If you order generic or equivalent casters this service is not included and your table legs will not be shortened. Set up on this item was a breeze. We ordered two, one for our fry station and one for our counter in the front of the house. Comes with facets and drain catch. Nice sink. Well built. We had a splash guard placed around sink and it works perfectly for a versatile hand washing station and utility table at our ice cream shop.